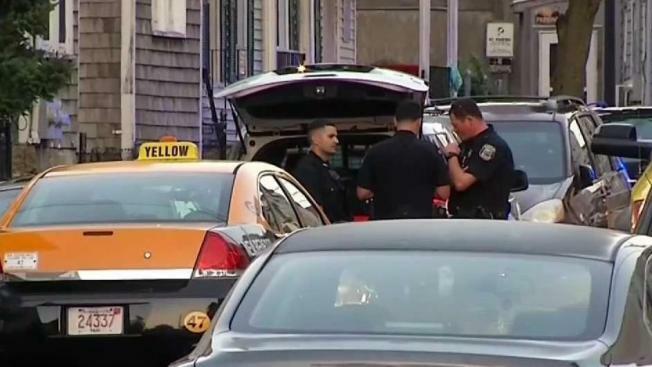 Authorities say a Massachusetts cab driver fatally shot a passenger who tried to rob him. Prosecutors say the other man, who has been identified as Kyle Dawson, 23, of New Bedford, fled the cab before being apprehended nearly 12 hours later. The Bristol County District Attorney's Office says after the cab driver picked up two men in New Bedford, the men put the driver in a choke hold and used a knife to try to rob him around 1:00 a.m. Friday. Prosecutors say the driver managed to escape the cab and fired several shots, hitting 24-year-old Christopher Dunton, who was pronounced dead a short time later at St. Luke's Hospital. The district attorney's office says the driver, who has not been identified, had a valid license to carry. Maria Ribeiro heard the gunshots overnight and thought someone was trying to shoot her. "I was right there folding clothes. I said, 'Oh my God! Don't tell me somebody's trying to shoot me," Ribeiro said. Isaiah Sylvia, who lives across the street, also heard the gunshots. "It's sad to say you can't even go outside at certain times of the night," Sylvia said. Prosecutors say the other man in the cab, who has been identified as Kyle Dawson, 23, of New Bedford, fled the scene in the area of 20 Bentley Street. Dawson was apprehended on Frederick Street in New Bedford around 12:40 p.m. Friday and is currently in police custody, according to the district attorney's office.